That said, have yourself the mini and messily done sketchdump of the alicorn sisters in this particular AU! The Sisters are literal Goddesses of this world (goddesses of the sun and moon respectively) in that they are unable to die, are unworldly powerful, and they are among the some of the favorite gods that are worshiped in Equestria. The two of them have worship stones all over the place, as well as temples and monuments dedicated to them. The temple they tend to frequent is the one upon the highest peak of Equestria, but their visits there are often enough that others hope for gaining an audience with the goddesses, but rare enough for the possibility of actually seeing either of them is very likely to not happen. Celestia is the goddess of the Sun, and is often associated with Guidance, Power, Warmth, and Strength. Luna is the goddess of the Moon, and is often associated with Influence, Balance, Wonder, and Magic. ANYWAY, this sketchdump focuses of the “Deity” form, or the form that is often seen in depictions of them. This the form where they allow most of their unlimited power to flow freely. I took some inspiration from Okami and gave them markings, and they can appear to be either solid or somewhat transparent with some of the galaxy being visible upon their bodies. Either way, though, they’d have an ethereal glow present at all times, and their eyes are typically glowing so brightly it’d be hard to see the color of their irises. For Celestia, I gave her “sunspots”, or markings that vaguely resemble her cutie mark. Said cutie mark is also much larger and covers nearly the entirety of her flanks. 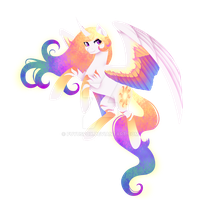 Her mane and tail are, instead of the usual semi-rainbow of her canon counterpart, is more the color of blazing fire, which eventually gradient to a sunset color when in close proximity with her sister. In this form, her connection to the sun almost makes her white coat shine so brightly that it’d be painful to stare at her for too long. In addition, the air around her will become very warm, but not uncomfortably so; this is due to the fact that she’s mindful enough to keep a leash on the heat she can release from her skin. Same with the light; she usually keeps it contained enough that mortals can look at her for long periods of time, however they’d still have to squint (sort of like that of a very bright summer day). The inside of her wings reflect that of a golden nebula or the color of her mane. For Luna, I went with the new-found fact that the dark marking upon her flanks are exactly that; a marking, not a part of her cutie mark. Sooooo I played with that and gave her more markings similar to that of a “painted” horse, only with dark colors on dark instead of dark on light. Her cutie mark is more angular with the addition of stars, and along her body there are random white spots that could resemble stars as well. Her mane and tail reflect that of the night sky and space, sometimes exhibiting a nebula. Even still, when close to her sister, her mane also gradient to that of a sunset, however hers is more of the cool colors of the sunset to better match that of Celestia’s warmer colors of the sunset. The inside of her wings also reflect the night’s sky with the stars within them in this form. Wow! This is amazing! Are you planning on writing your headcanon a for Luna and celestias backstory? I drew Celestia like that too! Ugh you're so talented... I love looking at all these headcannon sketches! O O THEY HAVE THE SAME TAIL AS ME THATS SO AWESOME!! I hope you don't mind if I this to my group of AMAZING fanart,This is tri wish I could draw like you,it looks like it takes a lot of practice! Gorgeous job! I think artistagal will like this a lot too! I'm curious as to what the little circle with the X on their shoulders means? I also noticed discord had it. It simply means that's where the wings would be if I drew them there, but I didn't because it would have obscured their bodies. As such, many artists indicate that the wing (or whatever limb it may be) is present and the character has it, but it simply wasn't drawn to show their entire body without it getting in the way. How long do you do to draw a pony ? *CAN'T EVEN HANDLE IT* WTF HOW DO YOU DO THIS?! Oh wow! This is amazing! 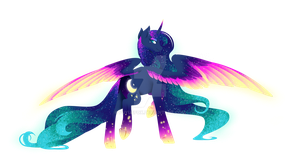 Luna is just gorgeous and Celestia is absolutely beautiful! This is an incredible piece of art! It is just incredible how deeply you look into there world! They're horses. Of course they'd have long muzzles.